When I met these two a few months ago, I knew right away they had a special connection. I was so excited when they decided to do a winter engagement session at Two Lights State Park in Cape Elizabeth, Maine. Two Lights State Park was the perfect place for an engagement session. The land overlooks a rocky Maine coast and two historic lighthouses are the park's landmarks. The freshly-fallen snow was perfect for this outdoor winter session. 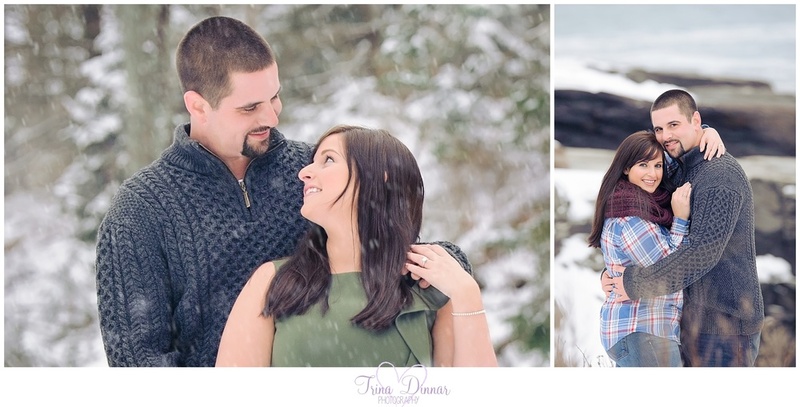 I loved how they braved the cold and hiking through the snow effortlessly! The couple also brought along their dog, Pogie, who made his appearances a couple of times. He seemed to really like the camera and even posed for me at one point! We actually grew up in the same hometown as children and technically met in 2nd grade. We had a brief (3 weeks at best!) junior high romance that we love to laugh about now. We remained friends throughout the years and kept in contact with each other throughout our various life stages. After college we became close again as the summer months drew us back to our hometown in Midcoast Maine which is where we fell in love. We spent the day boating on the lake together basking in the sun followed by a romantic dinner. Our engagement happened on July 26, 2014 and coincidentally resembles our first date in many ways, but with a lot more history and memories to fond over! We were at Mackenzie's family cottage on the lake spending a day with close friends. The day wound down and we were preparing to leave for dinner. "Stewart swears that I brushed my hair for 2 hours inside the house as he awaited for me to join everyone outside. Once I rejoined the group, Stewart took my hand and asked me to go for a walk onto the dock. Surprise! Stewart got down on one knee and asked me to marry him. I said YES! Of course, our friends were all in on the proposal and had champagne waiting for all of us to celebrate. It was my perfect proposal." What are some activities or hobbies that you love doing together? We love spending time with our dog, Pogie. We enjoy boating, hiking, camping, flying in Stewart's plane, traveling, exploring new places, bowling, fishing, spending time with family and friends, and many more activities. I'm looking forward to photographing the couple's wedding on September 10th, 2016 at the Falmouth Country Club.